It’s summer. Have you noticed? You can tell because it’s hot out. I usually feel that this is the time of the year for classic rock and old-school hip hop. Y’know, barbecue stuff. What I don’t usually think of is Indie rock. It’s more of a winter-y music to me, introverted stuff for staying inside and thinking about how sad you are with your overwrought feelings. When the sky is blue and even people like me (choosing to live in a city with public transportation so I don’t have to drive) fantasize about bumping up the speakers on an open-topped car, there seems like no good reason for the warm blankets of guitar fuzz. Why mumble your lyrics when you can shout them at the top of your lungs? 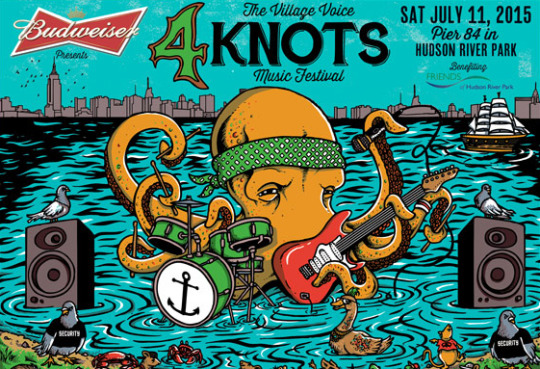 That being said, it’s an impressive feat of the Village Voice in putting together a festival worthy of Indie rock bands that exemplify summer in the best way. 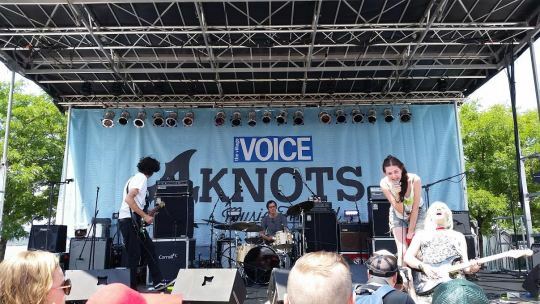 Youthful energy, fast guitars, and poppy melodies combined to create a sound that I would refer to as “surf-rock” if it seemed like any of the people onstage in their ripped jeans and introverted stances had ever surfed in their lives. It’s a type of music that I forget about sometimes, even though it’s huge. The chilled out middle, in between pop bangerz and morose stuff for banging your head on the wall. Finding a way to turn waves of static into just plain waves. Using that rhythmic alt-rock bass line and tight jittery drumming to maybe make you want to dance, but not in a way that makes you look like a fool. Maybe this is the stuff you listen to all the time, and I sound like an idiot for forgetting it’s there. But it’s an obvious thing that’s worth being reminded of anyway. 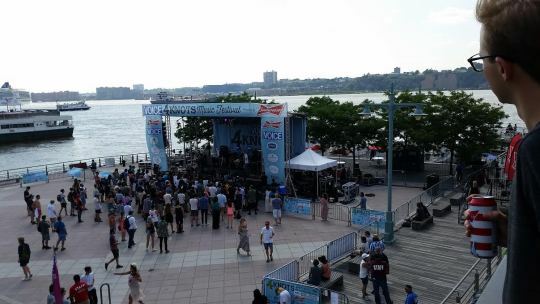 On a day like July 11, in a place like Pier 84 on the Hudson River, with a collection of bands that are this green and just excited to be playing a crowd of this size, everything clicks. Looking forward to this festival, I was most excited for the headliners Stephen Malkmus (former lead singer of Pavement) and his newer band The Jicks, and reunited Welsh psych-pop weirdos Super Furry Animals. Both legacy acts, with members’ ages reaching into their forties, and therefore people whose best albums came in a century with completely different digits. 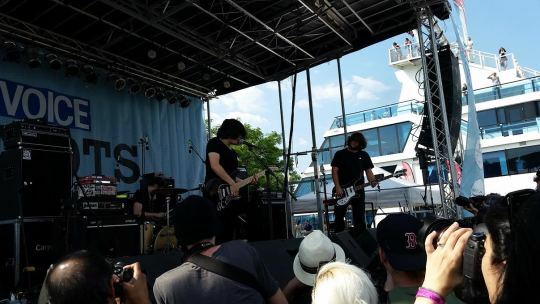 Compared to the beauty of youth that pervaded the first half a dozen bands at the festival, these bands, hitting the stage as the cerulean sky faded into navy at dusk, were adults. They were a little tighter and better at their instruments, which was sort of a shame. Compared to the eagerness of the bands during the day, these evening groups made me wonder what’s the point of putting a solid, good show when there’s so much more fun to be had with a sloppy mess. Stephen Malkmus and the Jicks – Back in high school, Pavement’s debut album, Slanted & Enchanted was my favorite album of all time. Seeing the singer whose slacker whine and meandering guitar defined my adolescence was a big deal. Of course, Pavement has been gone for almost two decades, long enough for Malkmus to have played with the Jicks more than he ever played with them. But hey, I like the Jicks. I was really into Face The Truth back when that came out, and I thought their newest album was pretty good, with Malkmus singing a nice Lou Reed impression. Super Furry Animals – SFA came out once it was fully dark, along with a full use of the multi-colored lighting apparatus that had been there for all of the bands but had seemed completely frivolous. 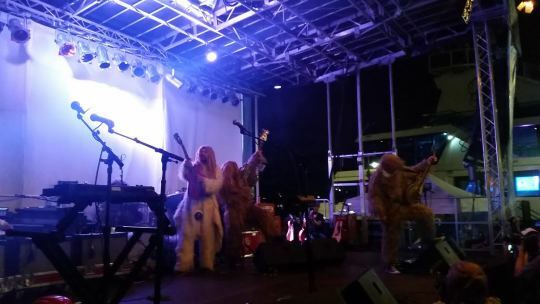 They wore baggy white full bodysuits that looked like they belonged to NASA that shone with all the rainbows projected onto them.There were props–Power Ranger helmets, signs calling for “Applause”, and, for the encore, super furry costumes to fit their namesake. The visual gimmicks were fun, but also clearly incidental to the performance they were putting on. There was very little going on visually in the music – they played the songs without much dancing, posing, or intense showmanship. They were a reunion touring band (straight from their first show in six years at Glastonbury) and their attitude was clearly that they didn’t need any of that silliness. They played the great songs they wrote twenty years ago, and they played them well. They already made it to being rock stars, so who needs to show off? What more could you want? For someone like me who is really into the Animals psychedelic weirdness version of what is often labeled “Britpop” (even if they were Welsh), it was easy to be happy with what they gave us. The band played with the confidence of not just headliners but of returning champions, and the skill of people who had played these songs hundreds of times before. It would be ridiculous for me to gripe about seeing “Do Or Die,” my favorite of their songs, with the intensity of their musicianship and the added bonus of a great freakout from the rainbow lights.